The Bretton Woods Transcripts, edited by Center for Financial Stability (CFS) Senior Fellow Kurt Schuler and CFS Research Associate Andrew Rosenberg, offer the reader a front row seat at the conference that has shaped the international monetary system for nearly 70 years. The Bretton Woods Transcripts were never intended for publication, and give an inside perspective of what participants at this major international gathering said behind closed doors. 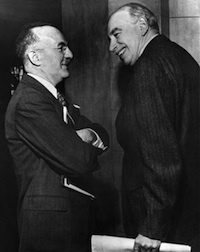 Schuler and Rosenberg spent more than a year carefully and skillfully editing never before published transcripts as well as creating summaries of meetings and participants that established the International Monetary Fund, the World Bank, and post World War II international financial system. Schuler found the transcripts while browsing in a section of uncatalogued material in the library of the U.S. Treasury Department. The Bretton Woods conference began a new era in international economic cooperation that continues today. The Bretton Woods Transcripts is the first book issued by the Center for Financial Stability as a publisher. Other CFS experts have published books with leading academic and commercial presses. We saw an opportunity to offer an important book at a much lower price than is usual for works of such scholarship, and to innovatively use the possibilities of electronic publishing to make available a wealth of supplementary material in companion files available elsewhere on this site. 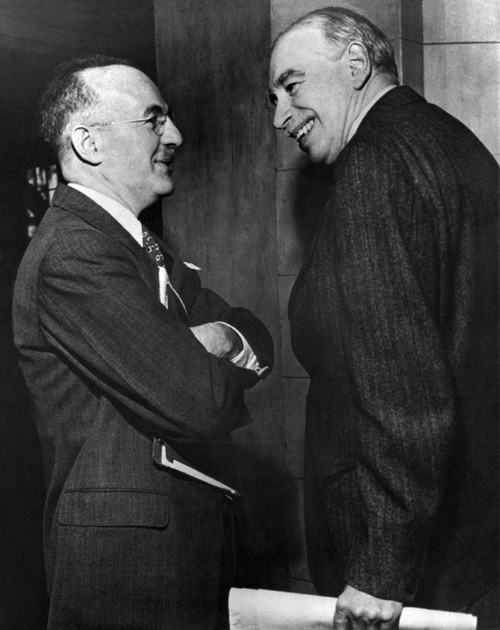 Harry Dexter White (left), chief U.S. negotiator of the Bretton Woods agreements, and John Maynard Keynes, chief British negotiator, at the first meeting of the IMF and World Bank governors in 1946. Fred Vinson (U.S. delegate, future Supreme Court chief justice): We are met here in Bretton Woods in an experimental test, probably the first time in the history of the world, that forty-four nations have convened seeking to solve difficult economic problems. We fight together on sodden battlefields. We sail together on the majestic blue. We fly together in the ethereal sky. The test of this conference is whether we can walk together, solve our economic problems, down the road to peace as we today march to victory. Sometimes [certain] problems seem to be most important on a particular day. Some folks think that the problems of the world were made to be solved in a day or in one conference. That can’t be. We must have cooperation, collaboration; utilize the machinery, the instrumentalities, that have been set up to provide succor to those who are hungry and ill; to set up, establish instrumentalities that will stabilize or tend toward stabilization of economies of our world. Ansel Luxford (United States): You have a question here, too, of an international body that has both political and economic phases. In other words, this document is an attempt to marry, to mingle and to blend the political aspects of this agency with the practical business aspects of the agency, the economic aspects. Institutions in the past have been established on more or less completely commercial lines. Others have been established on completely political lines. This whole document is an attempt to blend those two concepts. Unidentified U.S. delegate: Mr. Chairman, it might be possible to give a definition of gold convertible exchange which would be satisfactory to everyone here, but it would involve a long discussion. On the practical side, there seems to be no difference of opinion, and it is possible for the monetary authorities of other countries to purchase gold freely in the United States for dollars. There are a number of other currencies which can be used to purchase dollars without restriction, and these dollars in turn [can be] used to purchase gold. The definition of gold convertible currency might include such currencies, but the practical importance of holdings of the countries represented here is so small that it has been felt it would be easier for this purpose to regard the United States dollar as what was intended when we speak of gold convertible exchange. John Maynard Keynes: We, like you, are great believers in the beneficent influence of knowledge on these problems. There is hardly any greater service the Fund can do than provide up-to-date barometers of the monetary problems of the world. We hope that the very greatest importance will be given to the statistical branch of the Fund and that they will be encouraged to make reports [for] the instruction and benefit [of] all of us on a scale that has never been possible heretofore. “The global economy is stuck with low growth rates and over indebtedness in very many leading countries today. The two issues - growth and fiscal/private debt overhangs - are the classical scopes of work of the International Monetary Fund; and we see that in this epoch the global institution named, has been relegated only to a back seat, while the so called ‘Troika’ does most of the diagnosis and most of the decision-making. “A fascinating and useful new e-book, The Bretton Woods Transcripts, has just been published by the Center for Financial Stability (CFS). While an 822 page ‘transcript’ might turn off all but the most serious monetary scholars, Kurt Schuler, who discovered the transcripts in the Treasury, and his coeditor Andrew Rosenberg have done a remarkable job of making the book user friendly. Their commentary is fascinating in its own right. Moreover, standard search engines allow one to easily scan through the document looking for topics or participants. If you would like to contribute information or have questions about Bretton Woods, please contact Kurt Schuler, kschuler@the-cfs.org. Excerpt includes table of contents, preface, introduction, and sample transcript.